Charles Ponzi must be turning in his grave! His pyramid scheme in 1920 guaranteed returns of 50% in 50 days and 100% in 100 days. And initial investors clearly achieved these returns but most of them were too greedy to cash in. His total scheme “only” lost $20 million ($225 million in today’s money) for the investors. In comparison, Madoff cost his investors $18 billion. At least Ponzi became famous for his achievement. So far Madoff has not achieved fame. But both Ponzi and Madoff were small time crooks compared to governments and central banks today. Because whether we take, Japan, China, the EU or the USA, they have all created Ponzi schemes which are exponentially bigger than what Ponzi did. Admittedly no government is promising the 50% return that Ponzi did or Madoff’s 10-12%. Instead they are giving investors of their “Ponzi” bonds the illusion that they will receive the capital back. To paraphrase Mark Twain, investors are neither going to get the return ON their money nor the return OF their money, at least not in real terms. How could any major nation ever repay their debt? Take the US, they have increased their debt every single year since 1960. And at that time it was only $280 billion and today it is $19 trillion. Anyone under the illusion that their investment in US treasuries will be reimbursed in real money needs a reality check. So there goes $19 trillion down the drain. The US used to be a major manufacturing nation. In the mid-1940s manufacturing wages were almost 40% of GDP. Today it is below 10%. 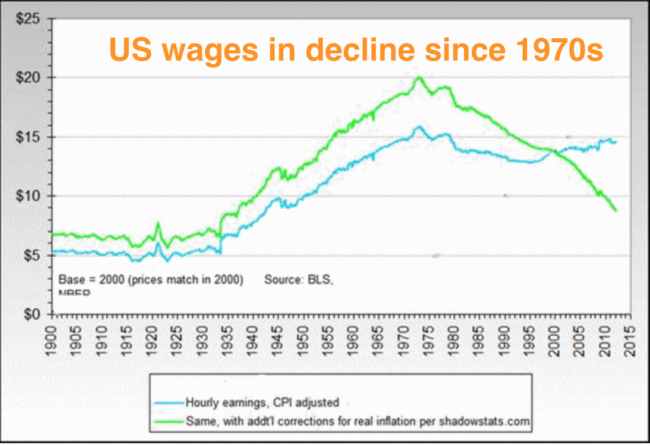 A major economy cannot survive on nail bars, pizza deliveries or Facebook, especially since average real wages for the majority of US workers has not increased since the early 1970s. Even worse, profit (EBITDA) growth has turned down since 2010 and is now negative. China, Japan or EU – which one will be the first to fall? So what about China. Well their total debts are up 16 times in this century and is still growing rapidly. But their GDP growth has been coming down since 2008. From an incredible year on year growth of 25% in 2008, China is now supposedly growing at 5% per year. Even that figure is hard to believe bearing in mind the slowdown in trade, transport, container traffic etc. It is Emerging Markets’ investment that has been propelling global growth and as that stops so will the world. What about Japan, the world’s third largest economy? They have been in trouble since the early 1990s but have survived due historically high savings as well as the rest of world buying their goods. The only dilemma is that this has been achieved at the cost of a massive debt expansion and zero interest rates. In 1990 Japanese government debt to GDP was 70%. Today it is a massive 250%, the highest in the industrialised world. The balance sheet of the Bank of Japan back in 1990 was 10%. Today it is over 80% and will soon be over 100%. As a comparison, the Fed’s balance sheet is “only” 25% of US GDP. The Japanese economy will definitely not survive the Ponzi scheme that the country has created. I could go on. The EU super state is a total failure that will drag all the member countries down. We know that Greece, Italy, Spain and Portugal are bankrupt and so will France soon be. But Germany has also been dragged into this mess and their banking system will not survive the exposure they have to Europe. The massive leverage of Germany’s banks and the derivatives position is guaranteed to bring Germany as well as Europe down. Also, Germany’s life insurance companies are in trouble like most insurers in the world. They have been told by the regulator to increase their capital at a time when profits are declining. I have said it many times, insurance companies as well pension funds are not going to survive the coming global downturn. The consequences are obvious, insurance cover of all kinds will disappear and so will most pensions. Very few people are aware of these risks and the repercussions will be horrendous. We know that we currently are in the midst of the biggest Ponzi scheme in history. It would have made Charles Ponzi green of envy. We also know that virtually no one sees that the emperor is naked. And even for the few who can see it, it suits them not to tell anyone. I recently had a discussion with a retired top London banker. To him it was clear that assets in the major economies are greater than the debts and that these countries have no problem paying the interest on their debts. Therefore, he saw no problem in continuing as we are. The fact that debt is increasing exponentially and interest rates are manipulated to zero or negative and that currencies accelerating to the bottom did not worry him. Well it seems to worry nobody. There appears to be 7 billion Krugmans in the world. Sadly, conventional wisdom is just conventional and not wise at all! There are innumerable examples of the total mismanagement of the world economy and the massive bubble of the financial system. But sadly only a minuscule fraction of one percent of the world population realise the catastrophe facing the world. We don’t know of course when these risks will turn to reality. And I admit that it has taken longer than I expected. But when risks are major, it is critical to protect yourself against them. We all know that we can’t buy fire insurance after the fire. This brings us back to wealth preservation. It is not a coincidence that some of the most successful investors in the world are recommending physical gold as insurance against the risks that I have just discussed. Ray Dalio, the founder of an extremely successful hedge fund recently said “If you don’t own gold you know neither history nor economics”. And Stan Druckenmiller, a hedge fund manager that returned an average of 30% p.a. over 25 years just told investors to sell stocks and buy gold. It seems clear that gold finished the correction at $1,046 in December 2015. We are now around $1,300 and will probably move to the $1,400 level quite soon. But short term movements are totally irrelevant. Gold at $1,300 is an absolute bargain. It is the most cost effective insurance that anyone can buy against a bankrupt world economy and financial system. The beauty of buying gold as insurance is that the “premium” you pay for the insurance i.e. the price of gold is very likely to increase substantially in value in coming years. Could there be a more perfect insurance against global risk than physical gold. I doubt it! 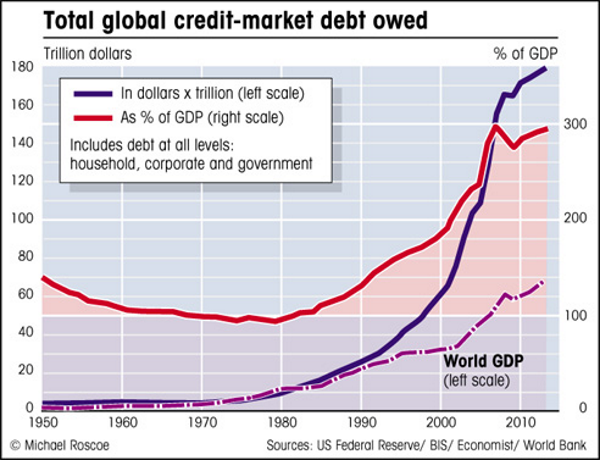 Tagged credit market debt, Madoff, Ponzi scheme.